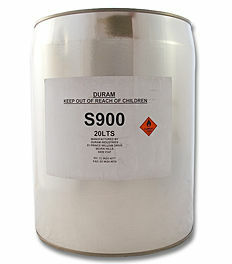 Duram S900 is a clear, high pH, deep penetrating siloxane waterproofing solution. Duram S900 penetrates in to the tissue of porous substrates and creates a waterproofing barrier below the surfac preventing the ingress of water. Duram S900 is an effective waterproofing solution and stops leaks without lifting tiles or changing the overall appearance of the surface. Duram S900 also solves the problems associated with water penetration such as corrosion of steel reinforcement, friability and binder loss of surfaces, fungal and bacteria attack and degradation due to carbondioxide permeability. Duram S900 is capable of withstanding high pH conditions such as found in new concrete and lime based mortars and bricks. Duram S900 still allows the diffusion of vapours or 'breathing' ability of the substrate. Waterproofing external concrete, cement, cement render, face brick, block walls, sandstone, porous pavers and other porous surfaces. Prevention or minimisation of of efflorescence and lataince (white salt spotting or leaching). Assists in preventing mould and fungus growth. Duram S900 has been used sucessfully on the following porous substrates when used correctly. Concrete, cement, cement render, block work, face bricks, porous pavers, grout (tiled areas), sand and cement tile beds, sandstone, terracotta pavers and other porous surfaces. Duram S900 penetrates in to the tissue of the substrates and accordingly relies its soundness and stability. Duram S900 will not bridge or seal cracks. In order for Duram S900 to work effectively, sufficient product must be absorbed in to the surface to fill the voids within the substrate. Highly porous, sandy and friable surface may not contain sufficient density to allow the Duram S900 to create an adequate 'build-up' of S900 to form waterproofing barrier. Test area are highly recommended. The quantity of S900 needed for a given area is subject to its density, porosity, thickness, soundness and condition which may not be apparent. Seals tile beds without lifting tiles. Dries clear in a flat (low gloss) finish. Using S900 is a very viable and economical first effort attempt to stop leaks. Provides excellent weatherproof barrier to rain and salt spray. When applying Duram S900 it is strongly recommended that all safety precautions are followed as per product label and data sheet. As the product contains solvent ensure that all sources of ignition are kept away. Ensure area is well ventilated. Adequate masks should be worn when spraying. Protect surrounds against overspray. Observe all precautions on the Material Safety Data Sheet. In exposed areas, do not apply if rain is immenent and protect coating from rain and inclement weather until fully cured. As a precaution, we suggest that , at least initially, the surface may be slippery if wet. Good preparation is essential. Surfaces must be sound, stable, dry, clean and free of dust, loose, flaking, friable material and substances that may diminish adhesion. All surfaces must be clean, dry, of sound construction, stable and free of any dust, dirt, grease, oil, curing compounds or contaminates that might interfere with adhesion.Cracks must be repaired. If mortar is suitable then use a non-shrink mortar. If flexibility is required to repair the crack, this should be done after the application of Duram S900 as the solvent may pit or slightly dissolve the sealant. Loose grout must be removed and then replaced with sound grouting and allowed to dry. Ensure surfaces are clean, free of other coatings such as paints and sealers and the substrate is dry. Efflorescence and lataince should be removed by wire brush and then washed and allowed to dry. Test areas are important as, although rare, latent salts or other chemicals may cause some discolouration. Duram S900 can be applied by brush, roller, spray or poured. It is essential that the substrate be well saturated, i.e. wet soaked. For best result, apply a soaking coat of S900 and allow product to be absorbed. Immediately thereafter, while still wet, apply a second soaking application and allow the product to be absorbed. This process can be repeated several times to ensure that sufficient product has been absorbed. The product should be, in the first instance, applied wet on wet. Then allow the product to dry for 24 hours and apply a final soaking coat. Ceramic tiled areas: 6m² per litre-concentrated on the grout lines. Terracotta tiled areas: 3m² per litre per coat. Face brick: 4m² per litre per coat. Highly porous areas: 2 to 3m² per litre per coat. Our recommendation is to err on the use of additional material as the initial absorbtion, wet on wet, is very important. Once cured, the absorbtion of additional material is greatly reduced. Duram S900 is a clear product and dries to a low gloss. Full cure:12 to 24 hours. Duram S900 should be stored in a cool, dry place. Keep all sources of ignition away from the product. Store in well sealed metal containers. Shelf life is up to 12 months in unopened or undamaged containers. Available in 4 litre and15 litre pails. All tools and equipment should be cleaned in Duram Solvent as soon after completion as practical. use of Duram's conventional waterproofing membranes. Sealed surfaces may be slippery when wet. The use of Solvent resistant gloves, mask and eye protection is recommended. Observe the safety precautions on the product data sheet and material safety data sheet. It is a class 3 dangerous goods must be declared prior to the transportation of the product. Product is flammable. Keep all ignition sources away. The information contained in this data sheet is given in good faith based upon our knowledge and current information and does not imply warranty. The information is provided and the product sold on the basis that the product is used for its intended use and applied in a proper workman like manner in accordance with the instruction in this data sheet onto suitable and correctly prepared surfaces which shall remain sound, stable, free of structural defects, cracking, spalling concrete cancer, negative pressure, movement or other conditions that may effect the performance of the product. Deviations from application instructions may diminish or negate the performance of the product. Under no circumstances will the Company be liable for any loss, consequential or otherwise, arising from the use of the product. Liability is limited to the replacement of proven faulty product. Duram S900 is suitable for waterproofing external concrete, render, brick, block walls & fibrous board. It is used for the Prevention of efflorescence (white salt spotting). Swallowed: Moderately toxic, can cause vomiting, diarrhea and drowsiness. Aspiration of vomited material can be very hazardous, can cause pneumonia. Eyes: Avoid eye contact. Mild to moderate irritation. Skin: Irritant, prolonged or repeated contact may cause dermatitis. Inhaled: Low toxicity; may cause headache and nausea. Swallowed: Do not induce vomiting. Give plenty of water to drink and seek immediate medical attention. If aspiration of vomited material occurs, seek immediate medical aid. Eyes: Immediately flush eyes with copious amounts of water. If Irritation persists seek medical aid. Skin: Remove contaminated clothing, wash with soap and water. Inhaled: Remove person to fresh air, keep warm and rest victim. If unconscious administer oxygen, if breathing stops, administer artificial respiration. Seek immediate medical attention. Product is flammable and should be applied in well ventilated areas. Ensure all ignition sources are removed prior to the application of S900. The wearing of protective clothing, goggles and gloves is highly recommended. Exposure limits: TLV-TWA: 150 ppm. The use of rubber gloves, safety boots and goggles (against splashes) is recommended. Suitable containers: Plain metal pails as recommended by manufacturer. Check containers are labeled and not damaged. Spills: Eliminate all sources of ignition. For spills > 100L, call fire brigade immediately. Otherwise contain all spills and absorb using straw, sawdust, sand, etc. Disposal: Dispose of material at a site approved by local authorities. Waste may be disposed of by controlled combustion, consult local authorities. Flammability Class: B. extinguishing Agents: CO2, dry chemical foam, BCF. Dangerous decomposition products: Carbon monoxide and dioxide. Reactivity Hazards:May react with oxidizing materials.